Do you understand the amazing – AMAZING – power of your mind? And do you know how to use it wisely? Do you understand that you can change your experience by changing the way you use your mind? Well if you'd like a quick refresher course / reminder of the amazing power of your mind and how to use it more wisely, you can read a summary of how your mind works in Barbara’s new e-book entitled The Mental Laws - Understanding the Power of Your Mind which we are giving away for free at the moment. To get your own free e-book, just send an email to info (at) beamteam.com and write The Mental Laws in the subject line and we'll send you your e-book within 24 hours. You can read the e-book on your computer, tablet, smartphone, Kindle and various e-book readers. 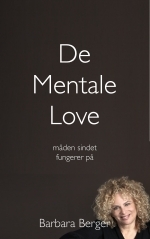 The Mental Laws is also available as a free e-book in Russian and in Danish. Barbara Berger wrote The Mental Laws in response to the huge success of her best-selling book The Road to Power / Fast Food for the Soul. Readers from around the world were asking – why are the mental techniques and exercises presented in The Road to Power so effective? Why do they work? Why do they instantly change our experience of life? The answer is because all the life-changing techniques in The Road to Power / Fast Food for the Soul are based on an understanding of the way the mind works – or what Barbara calls the Mental Laws. In this short, easy-to-read book, Barbara maps out this mechanism of mind and describes the impersonal laws which govern our minds and all our experiences. This information can be called the science of mind because it really is a science, since the laws which govern our minds are as impersonal and consistent as the law of gravity and other physical laws. Barbara's book, The Mental Laws, is designed to help readers everywhere understand the incredible power of their minds and learn how to use this power wisely to live the best possible lives. The birth of this book actually began in a very interesting way. It all started on New Year's Day 2000 when Barbara was a guest on the "New Millennium" radio show on Denmark's National Radio. During the show, the host and Barbara were talking about Barbara's popular book The Road to Power / Fast Food for the Soul and the host asked Barbara why the techniques in her book are so effective. To answer his question, Barbara began explaining the Mental Laws and the way our minds work. Her answers triggered a storm of telephone calls to Denmark's Radio from enthusiastic listeners so the station decided to send the program again the next day. When Barbara got home after the show, she realized she had to write her explanation of the mental laws down. The result is this fascinating book The Mental Laws. A book which is designed to help readers everywhere understand the power of their minds and learn how to use this power wisely to live the best possible lives. Since the book was first released in 2000 with the original title Mental Technology – Software for Your Hardware, the book has been published in many countries in many versions. Now Barbara's latest revised edition of the book called The Mental Laws is also available for the first time as an e-book.